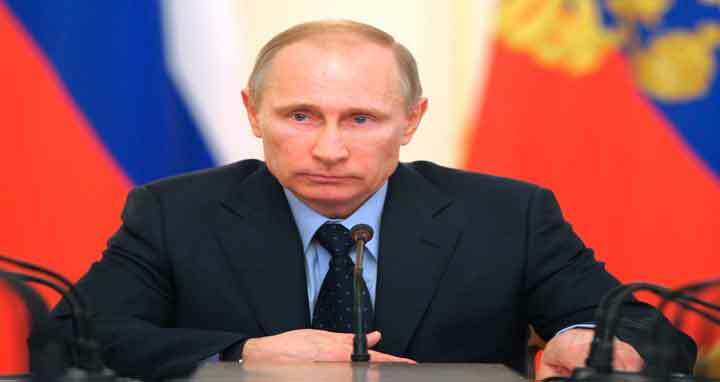 Dhaka 20 Mar, Abnews: Vladimir Putin on Monday said he would address disputes with the West after an election that saw him return to the Kremlin with a record vote share, as Moscow faces increasing isolation. The president, who has ruled Russia for almost two decades, on Monday denied he was driving a new arms race with Washington after he unveiled a range of "invincible" nuclear weapons this month. "From our side, we will do all we can so that the disputes with our (international) partners be resolved by political and diplomatic means," he said during a meeting with the seven other candidates he resoundingly defeated on Sunday. "It goes without saying that not everything depends on us -- as with love, both sides have to be involved, otherwise there can be no love at all," he said. Putin said he would focus on "increasing the well-being of the residents of this country" through investments in healthcare, education and infrastructure during his next term. With Putin's most vocal opponent Alexei Navalny barred from running for legal reasons, the outcome of the weekend election was never in doubt, and most of the suspense lay in how many people would turn out to vote. The Kremlin pushed for high participation to give greater legitimacy to a fourth term for Putin, who is already Russia's longest-serving leader since Joseph Stalin. But Navalny called on supporters to boycott the vote and sent out more than 30,000 monitors to voting stations. Navalny's movement and the non-governmental election monitor Golos reported ballot stuffing, repeat voting and Putin supporters being bussed into polling stations en masse. Fewer irregularities were reported than in previous years, however. An OSCE observer mission said that although the election was marred by a lack of "genuine competition", it was generally well conducted. Selfie competitions, giveaways, food festivals and children's entertainers were laid on at polling stations to entice voters. Analysts said Putin used tensions with the West to rally support and suggested that armed with a strong new mandate, he could push through further punitive measures against dissenters. Putin's campaign spokesman Andrei Kondrashov said that turnout, which was above 67 percent, was eight to 10 percentage points higher than expected. He claimed that was "thanks to Britain." London this month implicated Putin in the poisoning of former double agent Sergei Skripal in England with a Soviet-designed nerve agent. Most of the voters AFP spoke to said they had backed Putin despite Russia's problems of poverty and poor healthcare, praising his foreign policies. Western leaders were slow to publicly acknowledge Putin's landslide win. German Chancellor Angela Merkel "warmly congratulated" Putin while stressing in a message she wrote the need to continue dialogue "to address important bilateral and international challenges and find viable solutions." French President Emmanuel Macron wished Vladimir Putin success in "modernising Russia" after his re-election, but urged Moscow to shed light on the "unacceptable" attempted assassination of an ex-spy in Britain. Macron also expressed concern over the war in Syria, in which Moscow plays a key role as the regime's closest ally, in a carefully-worded statement that steered clear of congratulating Putin directly. British Prime Minister Theresa May's spokesman said Britain would not comment on the vote until after a report by independent observers on the electoral process. And 24 hours after the election, there has been no public comment from US President Donald Trump. Among liberal Russians the mood was grim. "Have you been thinking about emigrating for a long time? This really is the ideal moment," remarked Stanislav Kucher, a journalist for Kommersant FM radio. Putin polled well ahead of his nearest rival Pavel Grudinin, the Communist Party candidate, who described the elections as "dishonest". With 99.84 percent of ballots counted, Grudinin had secured 11.8 percent.